Mason Students Battle of the Bands for Mason Day!!!! Want to get involved? THEN WE WANT YOU! Well it’s a new semester and with that we have some great job openings. If you want to get involved on campus, work in a great environment with student leaders and work with other student organizations/university offices then join the WGMU team! Want an official title with one of the most well known on-campus organizations where you’ll get amazing hands on experience? Want to network? Then apply! 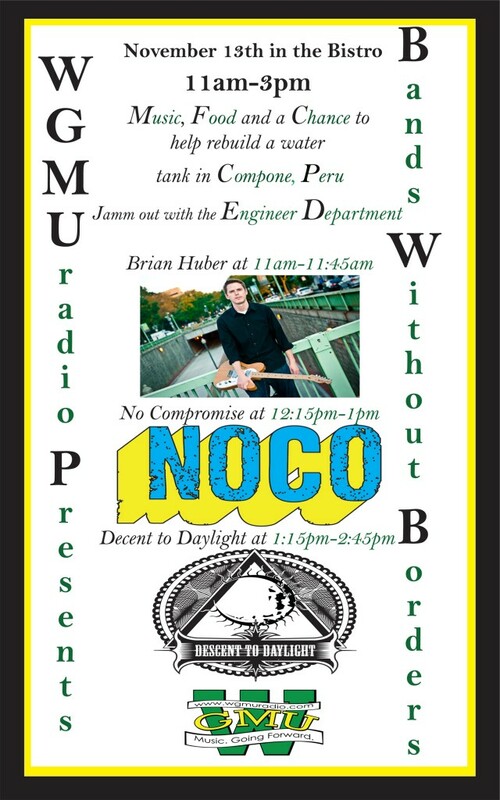 No matter what your major is, WGMU has a place for you. You must be a student at GMU to apply and there are no specific major requirements for any of the positions listed. All of the volunteer gigs are a great way to start out and can potentially lead to a paid position in the following semester with us at WGMU or possibly one within student media. On-air broadcaster: WGMU is always looking for DJ’s to host shows. Ever wanted to have your own radio show? Wanted to play the music you want to hear? Have a talk show talking about what you want to talk about? Well you can do that all here with WGMU, even if you don’t have previous experience. The position is for volunteer experience. Assistant Manager/Deputy Assistant General Manager: Are you interested in gaining management experience? Want to do a little bit of everything? The position entails assisting in the day to day operations of WGMU and working closely with the Program Director/General Manager and Assistant Program Director. This individual will gain direct management experience by working with the Program Director to oversee the general staff of WGMU. The goal of the position is to ensure that WGMU is moving forward with its goals, while continuing to uphold its high level of entertaining and professional broadcasting. They would also at times represent the Program Director/General Manager at meetings and work to make sure the staff is keeping up on assignments and etc. Even if you’re not interested in radio, the position is great for those interested in administration and management. This position is for volunteer experience and can lead to some great opportunities. All applications should be sent to Alex Romano: aromano3@gmu.edu. Questions may also be e-mailed to this address. Its been a great semester! We collaborated with countless numbers of on-campus student organizations, brought in artists for interviews from all over the country, interviewed top politicians, reported the latest news and played you the hottest music of today and yesterday. We’re now embarking into a new year with many changes. When we all come back from Winter Break, our staff offices will be in Student Union Building II, still here on the Fairfax Campus, with the rest of our friends at the Office of Student Media. Our studios will still remain in its awesome location, the bottom floor of the Johnson Center. This will help improve our ability to work with our sister partners such as the student-run newspaper the Broadside, student media convergence website Connect2Mason.com, the Mason Cable Network and numerous literary magazines and other subsidiaries of Student Media. But mainly we’re excited to be in a new office space! Thank you for supporting us this year. There have been SO many changes and they couldn’t have happened without the support of you, the listener. Our live winter programming schedule will be limited as classes are not in session over break, but still tune in as we are updating our off-air automatic rotation to include a collection of today’s hottest hits. That’s all for now, from all of us at WGMU, have a happy holiday! 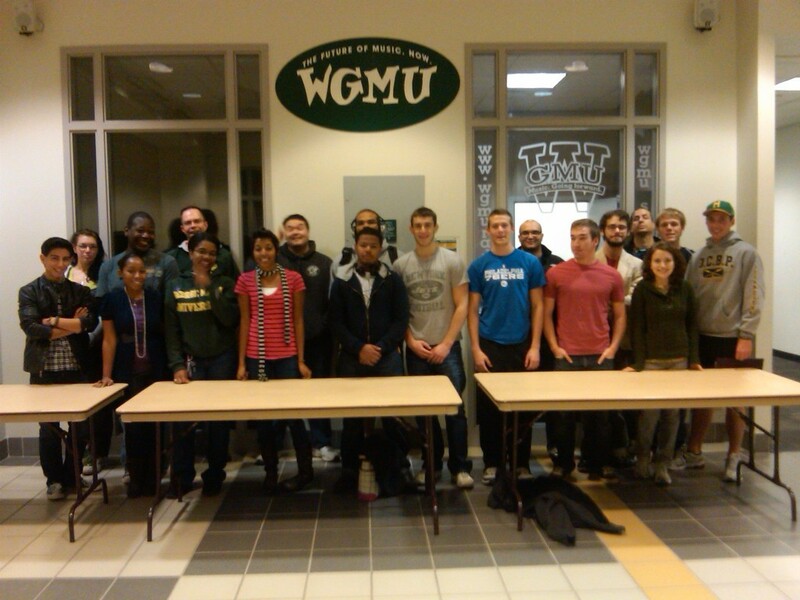 The DJs of WGMU Radio (minus a few)! 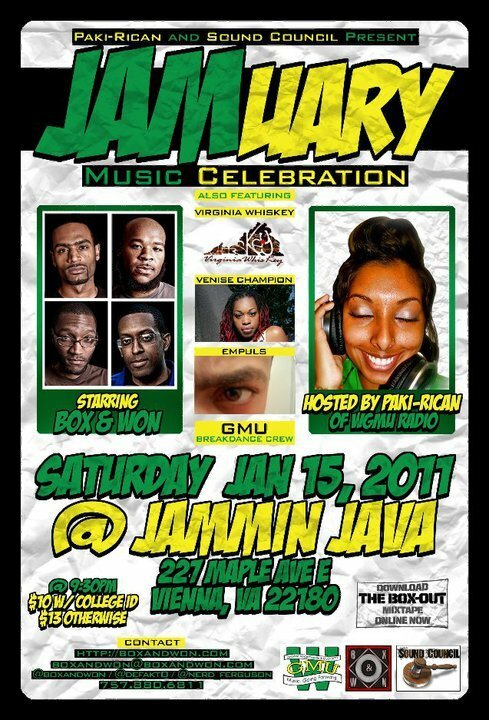 WGMU and BOX & WON Present JAMuary!!!!!!! Mason Students get in for $10!!! Regular admission is $ 13!!! On Thursday December 9th Student Media will be celebrating George Mason’s 285th birthday. The event will be taking place in the SUB I Patriots Lounge from 10:30am-1:00pm. 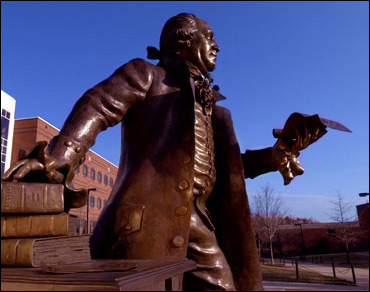 To help celebrate his birthday there will be an appearance by Gunston Hall’s George Mason along with President Merten and Tom Moncure. 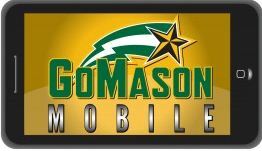 The event will also feature free birthday cake, games, prizes, along with the Patriot Leaders signing Mason’s Fight Song. Still e-mai me if you want to be part of the show next semester! 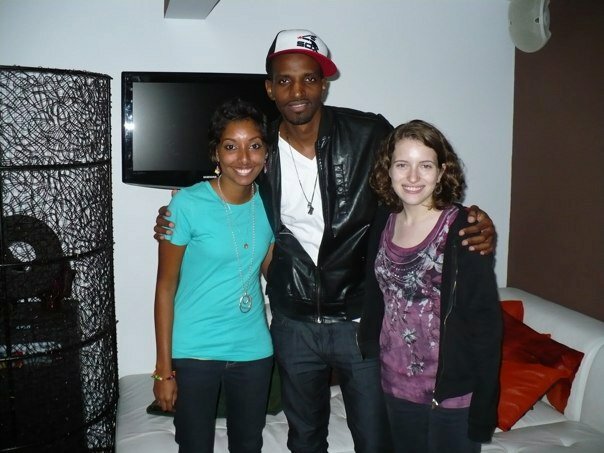 Last week Aisha and I traveled to DC to interview J. Ivy, a hip-hop artist who puts emphasis on his lyrics and spoken poetry. It was my first interview for WGMU, and I was incredibly nervous. What if I forgot my questions? What if J. Ivy wasn’t interested in talking with us? But I shouldn’t have worried at all. J. Ivy is more than just a performer: he’s an artist with a heart and with a mission. Easy to talk to and comfortable in his own skin, J. made Aisha and I feel more than welcome. We chatted for almost an hour about J. Ivy’s inspiration, goals, and career as a musician and teacher. As a kid, J. had plenty of experience writing— working on homework assignments and love letters to girls helped him develop his skills. But J. never intended to pursue writing or performing as a career. That all changed when an English teacher convinced him to appear in a school show. He received a standing ovation after delivering his monologue; from that moment on he was hooked. In college he wrote a girl a poem for Sweetest Day (a kind of second Valentine’s Day in October). His English teacher liked it so much he suggested that J perform his work at an upcoming open mic. J. quickly became a regular at performances on campus and became known as “the poet”. When asked about his inspiration, J. answered that life—what is going on around and inside him—is what motivates him to write. What is certain is that J’s uplifting music has inspired and touched many listeners. One fan even emailed J. to tell him that his music had helped her overcome her drug addiction. J. spoke with enthusiasm about a summer program in Aruba where he taught poetry to a small group of students. At the end of the two-week camp his students performed alongside theatre, dance, fashion, and DJ students. He is in the process of turning his Dream Big Foundation into the “J. Ivy Write to Live Academy”, an organization that will allow him to speak and hold workshops at different schools around the country. He is already well on his way—before stopping in DC he took time to speak to the students at a charter school in Maryland. J. Ivy comes from a musical family; his dad was a well-known DJ and his uncle a famous college band director. He grew up in Chicago, a city he loves to perform in (especially at The House of Blues). He acknowledged that Chicago-ians are hard to please—with all the gifted artists located in the city, you have to be really talented to stand out. J. also loves performing in New Orleans and has spent some time in Nashville, where he learned about the importance of story-telling through country music. We ended our conversation with Aisha’s signature question: If you had to tattoo something on your forehead, what would it be? J.’s response? “God [in big letters across his forehead]… and peace, and truth, and love.” It is clear that J. Ivy has his head (literally!) in the right place, a fact that his music makes more than apparent. Don’t believe me? Check out J. Ivy’s new CD, Here I Am at www.j-ivy.com . And keep your eyes peeled—I wouldn’t be surprised if J. finds his way to campus sometime soon. Join the International Engineering Group, WGMURadio, and Admissions for this amazing humanitarian event! We want to raise money to help bring a few undergraduate students to a small village in Peru called Compone. A water storage is in need of repair.Compone is a village of around 1500 people in the high Andes mountains (12,000+ ft elevation) about 30 miles west of Cuzco. They have very little electricity (maybe 2-3 lights), and basic water. This is a free event open to anyone, but we recommend donations of $5. We will additionally be raffling of sylish Peruvian hats and scarves from Compone. This week MTV announced they are launching a nationwide search for the next generation of artists. 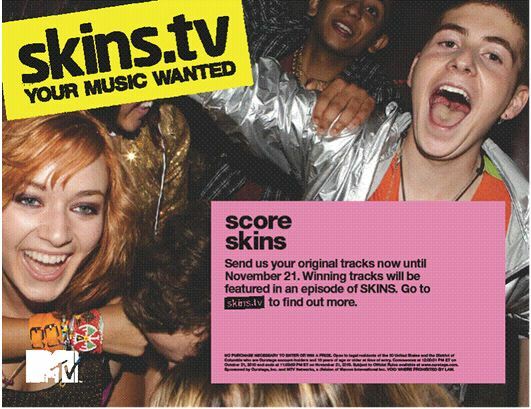 Aspiring student artists can submit original music to SKINS to have a chance to be featured on an upcoming episode of SKINS which will include both television and web content. All submissions must be full length songs, 100% owned by the artists, and does not need to include any vocals. Artists should not submit samples. The competition hopes to feature all genres of music including Indie, Rock, and Hip Hop. Songs will be reviewed and chosen by SKINS produces with help from an online voting contest. This unique opportunity will allow for amateur artists to gain exposure on both television and web content. Submissions can be sent to SKINS up until the November 21 deadline.